Fig. 1. 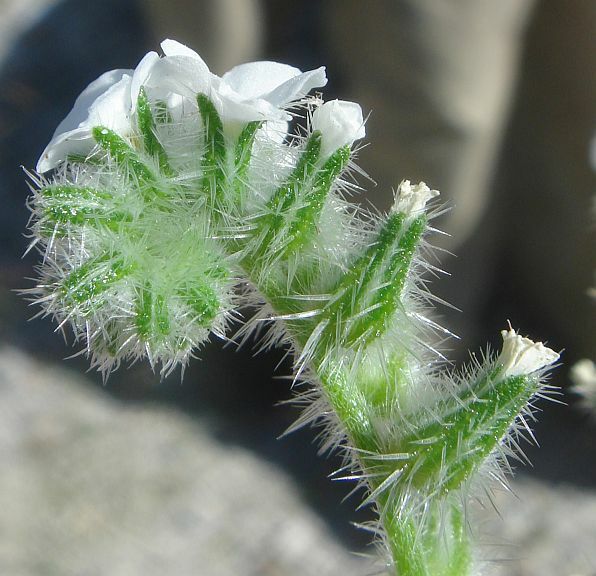 Photographs of flowers of three Cryptantha species. The images are scaled to show correct average relative sizes; a mm scale is on the right. 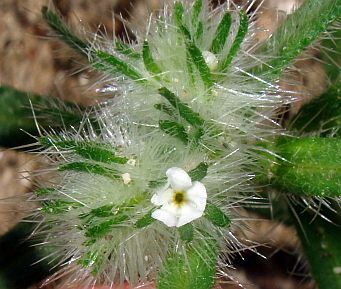 Cryptantha barbigera var. 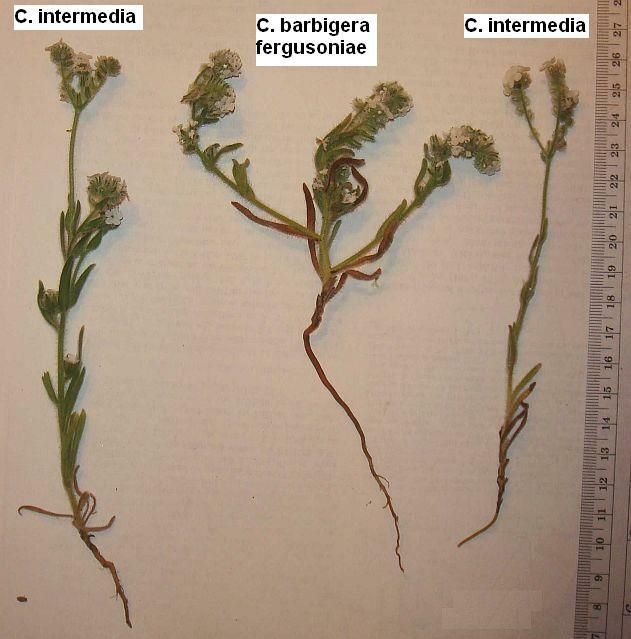 fergusoniae is synonymous with C. barbigera in the 1993 Jepson Manual, but is synonymous with C. intermedia at USDA Plants. To try to resolve this discrepancy in Whitewater Canyon, at the southeast end of the San Bernardino Mountains, I analyzed specimens of C. barbigera var. fergusoniae and C. intermedia. These two taxa are clearly distinct here. 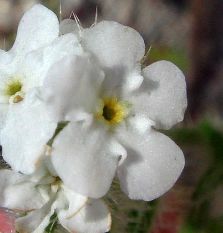 Specimens of C. intermedia from Whitewater Canyon are essentially identical in floral measurements to more coastal specimens of that species. Except for its much bigger corollas, C. barbigera var. fergusoniae is very similar to specimens of C. barbigera var. barbigera from the Borrego Desert. Thus the alignment of C. barbigera var. fergusoniae with C. barbigera var. barbigera is strongly supported by these specimens. C. barbigera var. fergusoniae, at least the Whitewater plants with corollas up to 10 mm across, is so strikingly different from var. barbigera in appearance (due entirely to the much-larger corollas) that I strongly support the plan to recognize both varieties as being distinct in the new version of the Jepson Manual. In fact, recognition of the two varieties of C. barbigera seems essential, since most people familiar with C. barbigera var. barbigera would have a difficult time recognizing these very large-flowered var. fergusoniae plants as part of that taxon due to the latter's two to three times larger corolla widths. Two additional findings came from this study. First, I found that corollas shrink ~8% in just five hours, and continue to shrink as they dry. Second, I report extended ranges for the corolla widths and calyx lengths for these three taxa. 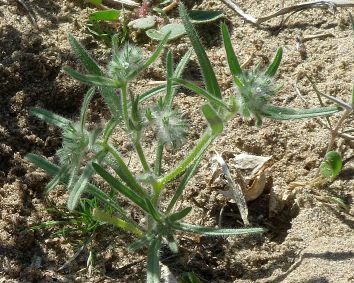 I was shocked when I came across plants of Cryptantha barbigera var. fergusoniae at the mouth of Whitewater Canyon since it was not immediately obvious to me what species they were. I keyed out a specimen, and was stunned to find that these plants, with corollas two to three times larger in diameter than the typical corollas of C. barbigera that I was familiar with from the Borrego Desert, keyed only to that species! I had seen this page a year or two ago, and had always been a bit skeptical about the existence of var. fergusoniae, since typical corollas of C. barbigera in the Borrego Desert are 3.0 mm broad, and range up to 4.0 mm broad, and thus do not key clearly to either variety. Furthermore, the Borrego Desert plants are from just a very small portion of the widespread desert range of C. barbigera. If these Borrego Desert plants were intermediate between these two varieties, it seemed to me that the 1993 Jepson Manual approach of lumping the varieties might be the best taxonomic choice. This would prevent botanists from grinding their teeth trying to shoehorn the Borrego Desert (and presumably other) specimens into one of these two varieties. Then Michael Charters found a real kicker, that USDA Plants gives C. barbigera var. fergusoniae as a synonym for an entirely different species, C. intermedia! This made me recall that I had been struck in the past at how similar C. barbigera and C. intermedia are. First, these two species are NOT distinguished by their nutlets at all; they have essentially identical nutlet properties. I then reviewed the data I've collected in the past on the calyx lengths in flower and fruit for these two species, and found that the separation between these species is not nearly as clear as the Jepson Manual key indicates. I've found calyx lengths in flower down to 3.0 mm for C. barbigera, which makes a calyx length of 3.0 mm a magic dividing line between these species, which always raises my suspicions. I've found calyx lengths in fruit up to 6.0 mm for C. intermedia, producing a range of 5-6 mm in which these species now overlap in their calyx lengths. I've found corolla limbs only 2.0 mm wide for C. intermedia, again producing an overlap between these species. As for the color of the corolla appendages, the bright yellow is just a gen characteristic for C. intermedia, and so cannot be relied on. A quick perusal of Calphotos shows that most corollas in those pictures for C. intermedia do not have bright yellow appendages; neither does the corolla shown in Mike Simpson's webpage nor the corolla shown above. This significant overlap in properties does make it seem possible that authorities might disagree about which species should contain a large-flowered, large-calyx taxon like C. barbigera var. fergusoniae. I did also find in my past data that the calyx in fruit is generally a factor of two different, mostly 4-5 mm for C. intermedia and mostly 9 mm for C. barbigera. Also the distribution of the two species are mostly clearly separate, with C. intermedia primarily west of the desert, and C. barbigera in the desert (see next section). All of this piqued my interest, so I decided to measure a number of plants of each taxon to see how clearly distinct these three taxa are. Fig. 2 shows the geographic distribution of these taxa, as determined from vouchers at the Consortium of California Herbaria. The locations where I measured specimens are labeled in the middle map. Fig. 2. Geographic distribution of three Cryptantha species from vouchers. 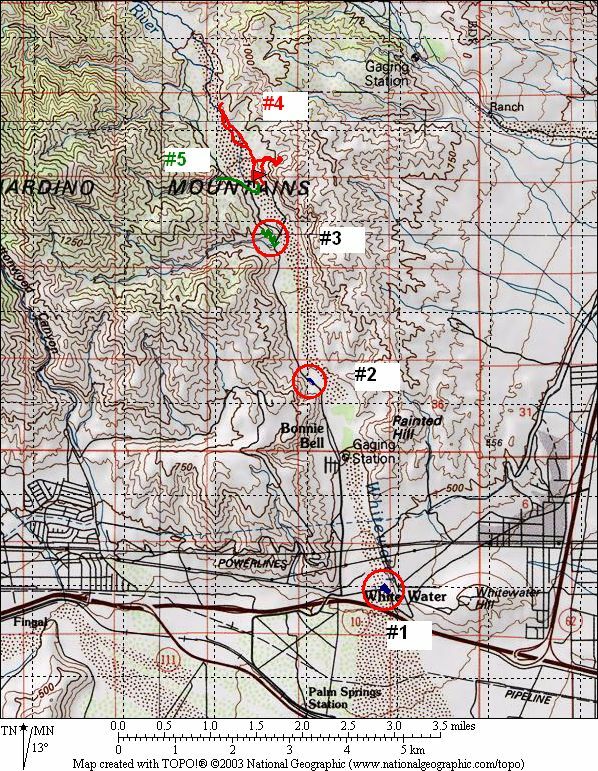 Whitewater Canyon is in the top middle-left in each map. Note that vouchers of both C. intermedia and C. barbigera var. fergusoniae are found there. Alma Canyon and Wash are at the lower right. The map of C. barbigera at the right includes all varieties, since all vouchers are just determined to the species except for the small number of var. fergusoniae vouchers. Thus it is impossible to conclude from these maps whether var. fergusoniae is the only variety found in its geographic range. With few exceptions, the distributions of C. intermedia and C. barbigera just barely overlap along the extreme west edge of the desert. There are only two vouchers of C. barbigera that encroach well within the distribution of C. intermedia, the ones of var. fergusoniae in Garner Valley and the San Jacinto Mountains / Santa Rosa Mountains divide in the middle of the map. Those vouchers (UCR201486 and UCR135716) should be double-checked for the determination, as should some of the C. intermedia vouchers that penetrate deepest into C. barbigera territory. 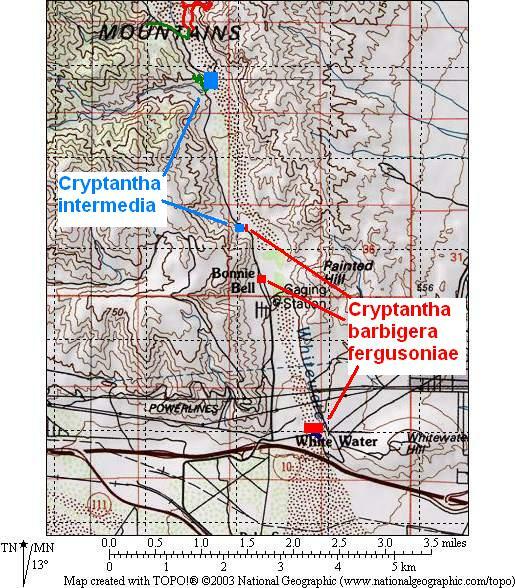 On 23 March 2010, I sampled C. barbigera in Alma Wash and Alma Canyon, part of the Northeast Vallecito Mountains. I nabbed an inflorescence branch from six different plants in Alma Wash, spaced throughout the 2.5 miles of my route through the wash, and two entire small plants in Alma Canyon, in order to measure the range of characteristics for them. The sampling was somewhat arbitrary, based primarily on when I remembered to sample a new set of plants at a sufficient interval after the last sample. Because I didn't measure these plants until 48 hours later, it was tedious to measure the corolla widths, since all the corollas had closed and shrunk. As a result, I only measured one corolla per sample. To gather better corolla width measurements, on 26 March 2010, I measured the corolla widths for seven different plants along the same route in situ, following the same somewhat arbitrary method. 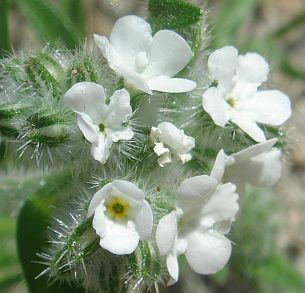 On 28 March 2010, I returned to Whitewater Canyon, and sampled the Cryptantha barbigera / C. intermedia population from the mouth of the Canyon up to the base of the Overlook Trail, just south of the Visitor Center. The sample sites correspond to locations #1, 2 and 3 on this map, with an additional location on the main road at the label Bonnie Bell in the above map. At each location except the Bonnie Bell site, I sampled three plants, selecting the first plants I came across that had the most mature fruit of plants in that area. At Bonnie Bell, I sampled only a single plant that I had noticed from the car in order to limit the number of plants I had to measure. See pictures of the six Alma Wash inflorescence branch samples, TC#1454 and the two entire Alma Canyon plants, TC#1455, sampled on 23 March 2010.
corolla width: 2.0, 2.0, 2.0, 2.0, 2.2, 2.5, 2.5, 3.0 mm, all from a single flower from each plant. Range: 2.0-3.0 mm. Median: 2.1 mm. These are all from the "middle-last" flowers on the plants, and so are likely to be smaller than earlier flowers. The flowers were all closed, and were opened under the microscope with a dissecting needle before measurement. calyx length in flower: 4.1, 4.2, 4.2, 4.4, 4.4, 5.0, 5.0, 5.5 mm, all from the same flowers measured for the corolla width. Range: 4.1-5.5 mm. calyx length in fr: 8.0, 8.2, 8.5, 8.5, 9.0, 9.0, 9.0, 10.0 mm. The measurements are the maximum length on each plant. Range: 8.0 - 10.0 mm. number of nutlets: six plants had 2 nutlets; two plants had 3 nutlets. A single fruit was opened on each specimen to obtain the number of nutlets. I also photographed 15 flowers on some plants, usually the measured flowers plus a few more, with a ruler next to the corolla tip, as in the flower at the top right of this page, and used those photographs to get more accurate measurements. The values, in order from smallest to largest, were 2.1, 2.7, 2.9, 2.9, 3.0, 3.0, 3.0, 3.1, 3.1, 3.2, 3.2, 3.2, 3.5, 3.8, and 3.9 mm. Range: (2.1)2.7-3.9 mm. Median: 3.1 mm. It appears that the corollas shrank significantly in two days, since the median measurement from the two-day old specimens was 2.1 mm, and the median measurement of fresh flowers is 3.1 mm. This shrinkage of ~1/3 is probably much more than would usually be seen in vouchers, since my samples were left in a bag at room temperature for two days and not pressed. Such shrinkage is not surprising; it can be seen on nearly any inflorescence such as this one from Whitewater Canyon (note that one has to re-open a closed corolla with a probe in order to make that measurement). The corolla width of even the second finished flower in that inflorescence is reduced by perhaps a factor of two due to the clearly-shriveled corolla. The following photograph shows a sample of C. barbigera var. fergusoniae (specimen #3, from sample site #1) between two specimens of C. intermedia (specimen #9 on the left and #10 on the right, from sample site #3). Fig. 3. Photograph of entire plants of three specimens from Whitewater Canyon. Specimens of C. barbigera var. fergusoniae were essentially as wide as tall, with branching occurring among the first nodes, whereas specimens of C. intermedia were very slender, much taller than wide, with branching occurring only well up the stem. Numerically, the width to height ratio for plants of C. barbigera var. fergusoniae ranged from 0.4 to 1.4, versus 0.1-0.3 for C. intermedia. The other strong distinguishing characteristic was the length of the calyx in fruit, about the same factor of two I've seen previously between these two species. Interestingly, there appeared to be no difference in the appearance of the corolla of all plants from all locations. The corollas looked identical, with the same bulges in the sinuses between the lobes, and with the same variation in color for the corolla appendages (see pictures at top of this page). There was a small mean difference in the corolla width, but such significant overlap in the distribution of the corolla widths that it was impossible to use this to discriminate the species. Measurements of the corolla width, calyx length in flower, and maximum calyx length in fruit were made under a microscope roughly five hours after plant collection. The process of making those measurements revealed that the calyces of C. intermedia were less hairy / bristly than those of C. barbigera var. fergusoniae. It was often very difficult to even see the base of the flowering calyx for C. barbigera var. fergusoniae plants, whereas it was much easier to see the base for C. intermedia. A summary of the range of the measurements for each specimen is in Table 2. Table 2. Flower measurements on Whitewater Canyon Specimens. The nutlets were checked for every specimen, but they all appeared identical, so they will not be further discussed. Fig. 4. Plot of maximum calyx length in fruit vs. the width to height ratio of the entire plant. The points are color-coded based on the width to height ratio. Individual measurements of the calyx length and corolla width (at home) on each flower, plotted in Fig. 5, also show a separation between the species, although the distribution is clearly continuous, without any obvious breaks to sharply delineate the species using these characteristics. It would not be surprising to find overlap between the two species with more data taken at different times in the development of each species. Fig. 5. Plot of calyx length in flower vs. the corolla width for individual flowers. The points are color-coded based on the width to height ratio. The geographic distribution of the two species in Whitewater Canyon from these samples is shown in Fig. 6. The two species have disjunct distributions in this sampling except at the location just north of the Bonnie Bell location. That area is almost entirely C. intermedia, with just a few plants of C. barbigera var. fergusoniae found on the drier, sunnier roadside near the top of the berm along the road. Fig. 6. Geographic distribution of C. barbigera var. fergusoniae and C. intermedia in Whitewater Canyon from this survey. The size of the boxes gives a rough idea of the abundance of each species at each location. Table 3 summarizes the range of measurements for specimens from these two areas. Table 3. 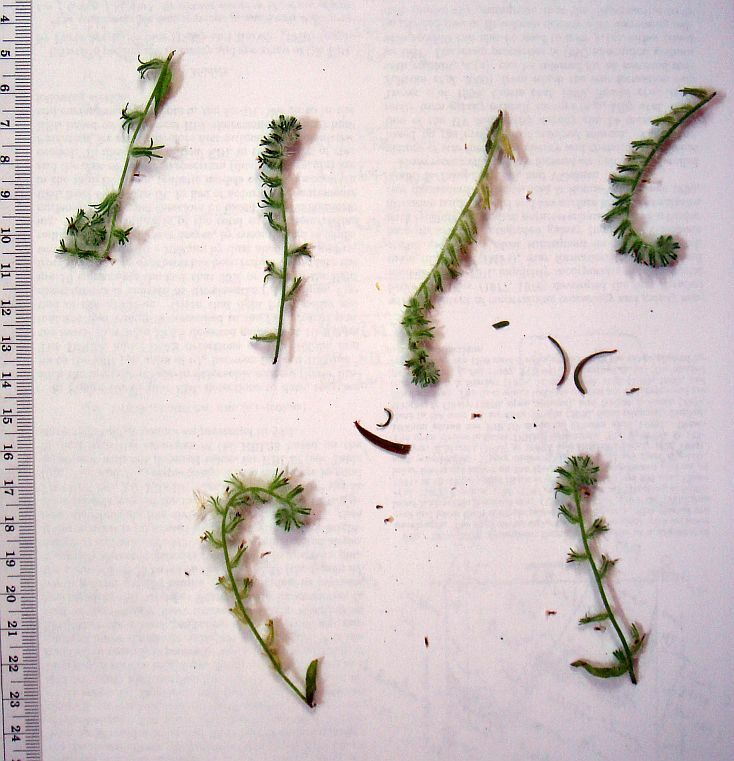 Flower measurements for Whitewater Canyon Specimens and Borrego Desert Specimens. The Whitewater corollas are 2-2.5 times larger, as expected, with no overlap in corolla width. Interestingly, the calyx lengths are a bit shorter in flower, and significantly shorter in fruit. However, the fruit may not yet have reached maximum development for the Whitewater plants, since they are at ~2000 feet elevation and the Alma plants are at 200-1000 feet elevation. A Principle Components Analysis of these measurements is presented in the next section. Measurements for all of these plants were compared to previous measurements I've made over the last five years of C. intermedia plants from coastal southern California and C. barbigera plants from the Borrego Desert, given in Table 4. Table 4. Flower measurements on non-Whitewater Canyon Specimens. 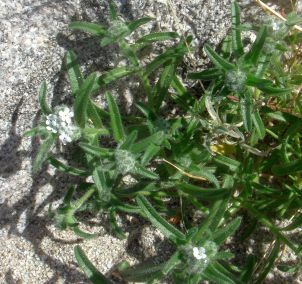 The C. intermedia plants came from the Santa Rosa Plateau, Torrey Pines, Santa Margarita Ecological Reserve, and Crystal Cove State Park. The C. barbigera plants came from Rockhouse Canyon, Henderson Canyon, Butler Canyon, and Glorietta Canyon. They include one Henderson Canyon specimen, the last one in Table 4, that has a minimum and maximum calyx length in flower of 3.0 mm that I had never previously been completely sure about its determination, due to the short calyx length. However, note that two other C. barbigera specimens in Table 4 have at least one calyx whose flowering length is just 3.0 mm. After scaling all measurements by the standard deviation, the data were analyzed for Principle Components. Fig. 7 shows a plot of PCA2 vs. PCA1. Fig. 7. Plot of Principle Component 2 (PCA2) vs. Principle Component 2 (PCA2) for Whitewater and non-Whitewater specimens. The Whitewater C. intermedia specimens fall precisely with coastal C. intermedia specimens. As expected, the Whitewater C. barbigera var. fergusoniae specimens do not fall with the C. barbigera var. barbigera specimens from the Borrego Desert, due to their much-larger corolla widths. They are also clearly distinct from all C. intermedia specimens. Fig. 7 shows that the suspect C. barbigera Henderson Canyon specimen fits well with the other C. barbigera, confirming its determination. This plant is also surrounded by zillions of other C. barbigera with longer calyces in flower, which is why I was troubled that its calyx length measurement keyed it to C. intermedia. A separate PCA was done for the same data, using only the three calyx measurements (min and max in flower, and max in fruit), in order to see if C. barbigera var. fergusoniae would now fall closer to other C. barbigera plants. Fig. 8 shows the results. Fig. 8. Plot of Principle Component 2 (PCA2) vs. Principle Component 2 (PCA2) for Whitewater and non-Whitewater specimens using only the calyx lengths. The five C. barbigera var. fergusoniae points all plot in two clusters, appearing as only two points in Fig. 8. With only three measurements in the PCA, the species separation is not as good. But clearly the Whitewater C. barbigera var. fergusoniae specimens are better aligned with the C. barbigera specimens from the Borrego Desert than with C. intermedia. This, of course, is obvious just from looking at the calyx measurements themselves. Corolla shrinkage. 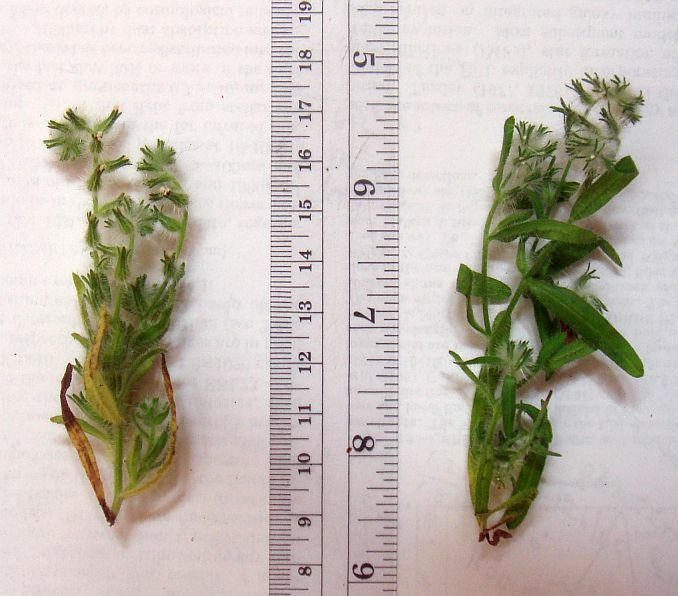 After measuring the corolla widths at home, roughly five hours after collecting the plants in the field, it was striking and unexpected that they were significantly smaller than measurements made in the field. Since individual flowers were not tagged, and the same flowers were not necessarily measured on each plant in both sets of measurements, direct comparisons on individual flowers could not be done. However, one can statistically get an estimate of the shrinkage by plotting the maximum corolla width measured at home vs. the maximum width measured in the field. Substitution of measurements of one flower for another will have no systematic effect on that plot. Fig. 9 shows that there is a clear trend of measurements at home being roughly 8% smaller than measurements made in the field. Fig. 9. Plot of maximum corolla width measured for each specimen at home vs. that measured in the field. The line represents an 8% shrinkage. somewhat larger corolla widths on average, 5.0-10.0 mm vs. 5.0-8.0 mm the C. intermedia plants there. Fig. 10. Photographs of C. barbigera var. fergusoniae from Whitewater Canyon (left) and var. barbigera from Coyote Canyon Road in Borrego Springs (right). The minimum calyx length in flower for C. barbigera is 3.0 mm, not 4.0 mm. The maximum corolla width for C. barbigera is 10.0 mm, not 1-2 mm. For the draft new Jepson Manual key given on Simpson's page, the maximum corolla width for var. barbigera should be 3.9 mm, not 2 mm, and 10.0 mm for var. fergusoniae, not 8 mm. The minimum corolla width for var. fergusoniae should be 5.0 mm, possibly as a parenthetical measurement indicating that values that low are not common. The maximum calyx length in flower for C. intermedia is 3.1 mm, not 3 mm. The maximum calyx length in fruit for C. intermedia is 6.0 mm, not 5 mm. Finally, I was able to determine that the corollas shrank 8% in just five hours. A big remaining question is how distinct these varieties are geographically, and whether they intergrade with one another or not. I plan on trying to answer that question in the future. I thank Ron Kelley and Mike Simpson for posting the information about C. barbigera var. fergusoniae, without which I would have been thoroughly confused by these Whitewater plants. I thank the organizers of the Whitewater Bioblitz in April 2010, since without the stimulus of that, I might still have never set foot in Whitewater Canyon. Voucher data provided by the participants of the Consortium of California Herbaria.